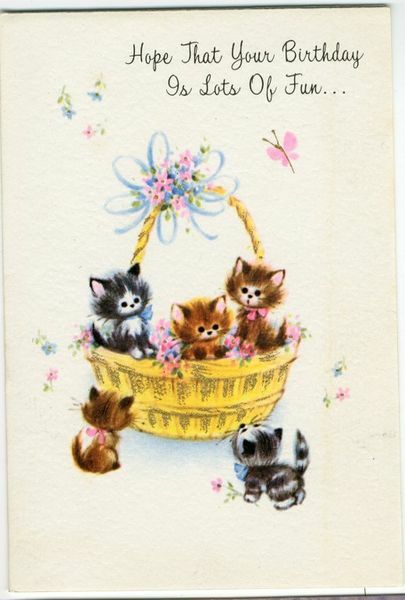 Colour printed card with an illustration showing two black and white kittens and three brown kittens sitting in and around a basket with pink flowers and butterflies. The card is formed from a single sheet of paper folded into quarters. 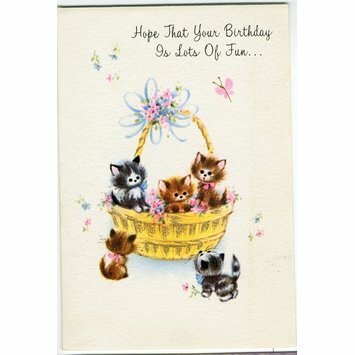 Printed in the top right-hand corner on front of the card. If Wishing / can do it - / consider it done! Printed on the inside of the card. Handwritten in blue ink on the inside of the card. Paint pallette with an R in the centre and a rose through the thumb hole. Rust Craft logo printed on the back of the card.